Here’s the bundled look I wore yesterday during the blizzard! As I was walking out the door to run to my office, Dash snuck out into the garage so I just brought him with me. Remember when Dash always use to make appearances in my outfit pics!? Love having him in these I need to start bringing him with me to shoot again! Love my handsome and loyal pup! Have a great weekend! Thanks so much for stopping by! Love your snow boots, Rach! what a cute white beanie, love it! Such stunning photographs! Wish we had that much snow in London! The snow looks so pretty in these photos! I love this black and white outfit! Who says dogs are man’s best friend? Who says diamonds are a girl’s best friend? Bunk, I think dogs are a girl’s best friend. if you are single and have a dog, if the dog doesn’t like the guy. …that is it the guy goes. BTW, LOVE black and white, fab combo! I love this winter outfit, Rach! 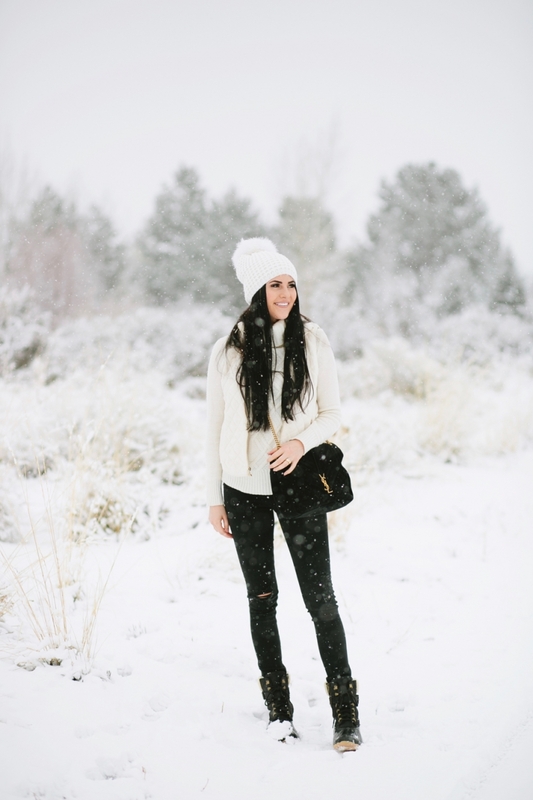 The cream sweater and vest looks so good paired with the black jeans and I love those snow boots, too! Dash is adorable, you can see the love he has for you in these photos, especially the second to last one, such a beautiful shot! Thanks for sharing, beauty, and I hope you have a wonderful weekend! I have a question about the boots. I ordered the black ones you are wearing after I saw the cream version you shared a few days ago. Are these really warm for your feet? Lined to the toes or just the ankles? I couldn’t really find info about that. I live in SLC as well, and I want something black, cute enough to wear, abut really warm for my feet as well. I bought a pair of Michael Kors duck boots and wore them to Luminaria, and my toes were numb. We were only out there 1.5 hours and it was only 25 degree/no snow. I love these look of these, but I really need them to be functional as well. Mine are on the way, but I’d love to hear what you thought being out in the snow in them yesterday. Thanks. I love the way snow looks in pictures! 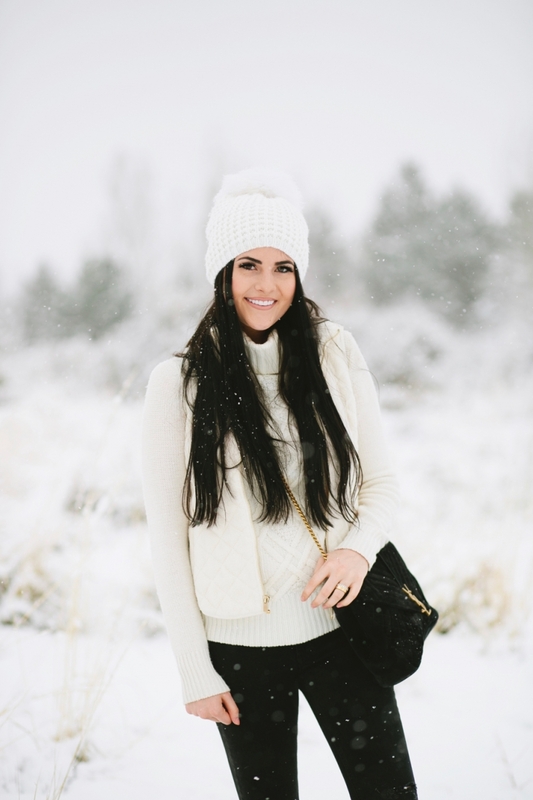 As much as I don’t want it to snow this weekend I love blog posts with snow! Such a cute look! Love the white and black! Those boots look so warm for this time of year! I love them! How funny!! My parents have Dash’s older brother and his name is Duke! How cute! love the white hat! looks great with your hair! I love those snow boots! It’s so hard to find cute ones that are tall enough to keep the snow from falling in but not too intense looking. Even thought the blizzard was probably cold I love how it looks, so gorgeous! I love your winter look! Your beanie is so cute! Are these boots really as warm as they look? I ordered them in black the other day when I saw them in cream on your post. The details on J. Crew aren’t clear. Is it just the ankle that is lined, or all the way to the toes? I recently bought a pair of Michael Kors duck boots and wore them to Luminaria. My toes were numb, and it was only 25 degrees outside. I live in SLC as well, so I would love to know if they are warm enough for those single digit days and snow we get. Oh my goodness, yes!!!! You will love them, I promise! So simple but classy, cozy, and elegant. I love it :). You look amazing! Love those boots. Dash has the best smile. Das is so cute. I love your vest. What a lovely photoshoot ! Hello Mr. Dash…. pup melts my heart!! Still, (and I don’t even know if you’ll read comments of “old” posts) I did not want to let this day pass without a big “Happy Birthday”. You truely is my biggest inspiration… I don’t have any idol (like singers os actors lol), so maybe I can say i’m a fan of yours, since it was just you and Drew. It’s so cool see you growing up like a mother and entrepreneur. By the way, that first “hallo” from Isla ❤ OMG, melted my heart! She’s the cutest little girl! I hope your year is full of achievements, success, love, health and “tears” of joy. Thank you!! You are so sweet!! Thanks for following along! I hope you are starting to feel better!! Hey! Are you bringing Isla to NYFW? We are bringing Andi. Maybe they can meet! 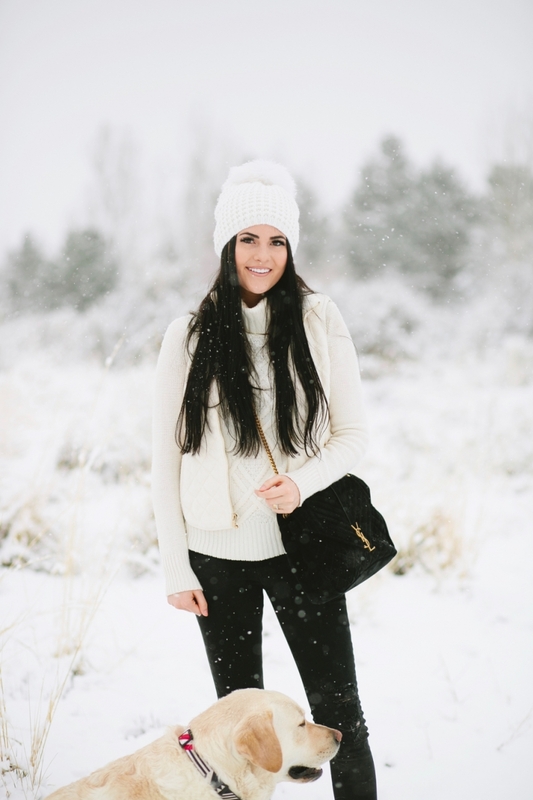 love this fun snowy look! cute post! 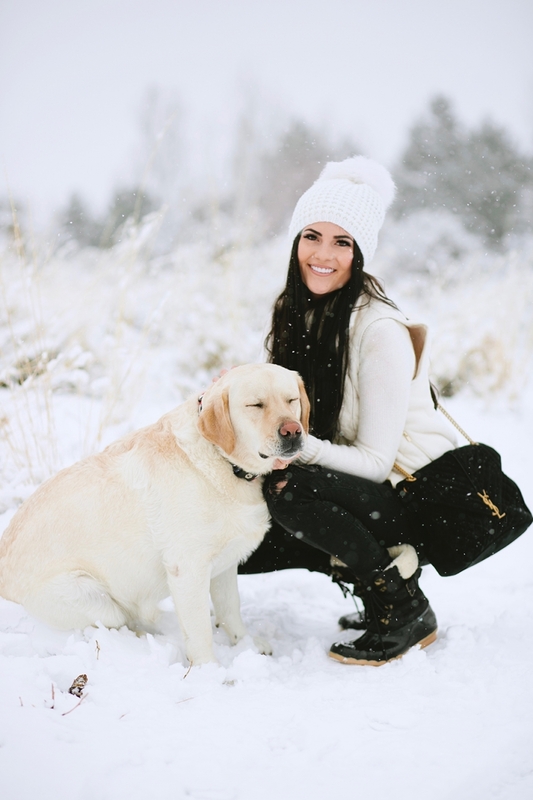 Snow makes for the best photo opportunity especially with a sweet puppy! Cute outfit. Amazing hat!! Your look is so beautifull and inspiring! Great look!